Given that two-thirds of the loyal refugees of the American Revolution found sanctuary in Nova Scotia, it will be no surprise to learn that many of the province's geographical features bear names related to significant figures from that era. Today we'll take a virtual tour of the "fourteenth colony" and learn about some of the loyalist place names found on the map of Nova Scotia. Loyalists began arriving in Nova Scotia as early as 1775, came in their thousands in 1783, and emigrated there from England in subsequent years. For many of these refugees, their saviour was Sir Guy Carleton, the commander in chief of British forces in North America. Charged with overseeing the removal of all the king's troops through the port of New York, Carleton could not abandon the loyal Americans. In writing to the British prime minister, he said "it is utterly impossible to leave exposed to the rage and violence of these people, men of character whose only offence has been their attachment to the king's service." And so Carleton marshalled the resources at hand, organizing fleets of evacuation ships to send loyalists to Nova Scotia, England, the West Indies, and the province of Canada. Those who settled in Nova Scotia did not forget his efforts. In Yarmouth County, there is a town, a river and a lake named Carleton. Shelburne County has its Carleton Village and Carleton Village Shore. There is a Carleton Head in Cape Breton, and Carleton Corner in Annapolis County. Many of the commissary staff and black teamsters who worked for Carleton in New York went to Port Mouton. They honoured Carleton by using his first name, calling their settlement Guy's Borough. When the town burned down a year later, they moved to the Chebucto Bay area, naming the principal settlement Guysborough and another Guysborough Intervale – and later the entire county bore this name. At one time Shelburne County's Birchtown was the largest settlement of free Africans in all of North America. Carleton saw to it that these former slaves were given certificates of freedom, fulfilling the crown's promise that anyone enslaved by rebels who joined the British would be emancipated. He put Brigadier-General Samuel Birch in charge of issuing these certificates. When Black Loyalists were put ashore near Port Roseway, they established their own settlement – one comprised of people who had been set free by a General Birch certificate. Both Shelburne County and Guysborough County's Birchtowns are named for this friend of enslaved Africans. A look at the map of Hants County will reveal Rawdon, Upper Rawdon, Centre Rawdon, Rawdon Gold Mines, South Rawdon and the Rawdon Hills. This area was first settled by loyalist refugees from South Carolina as well as the disbanded members of the 2nd Battalion of the 84th Regiment. The latter had fought in South Carolina at the siege of Forty Ninety-Six in May of 1781. It was Francis Rawdon-Hastings and his Volunteers of Ireland who rescued over 500 displaced loyalists and soldiers who were inside the fort, sparing them death at the hands of vengeful rebel forces. Admiral Robert Digby, commander of the North American Station, organized an evacuation convoy that brought 1,500 loyalists to Conway on the Annapolis Basin in the summer of 1783. Within four years, the grateful refugees named both the town and the county in his honour. For a time the admiral and his wife lived in Digby, but only their well and the grave of their daughter have survived to the present. The bell that Digby donated to Trinity Anglican Church is still in use. Pictou County's Abercrombie is named for a British hero of the Battle of Bunker Hill. General James Abercrombie, who served with the Royal Highlanders, was killed during the landmark battle on June 17, 1775. Some towns in Nova Scotia have very ordinary loyalists as their namesakes. Digby County's Tiddville is named for Samuel Tidd who was a private in Col. Beverly Robinson's Loyal American Regiment. The New York loyalist and his wife Elizabeth settled on Digby Neck with their five children. Gilbert Cove, in the same county, was named for Lt. Thomas Gilbert, a loyalist from Freeport, Massachusetts (Maine). Barton, a small community across St. Mary's Bay from Digby Neck was named for Lt.-Col. Joseph Barton. This New Jersey loyalist was recognized as a capable man; the colony's governor mandated Barton to establish a school for the children of Black Loyalists. However, a foolish bet brought the loyalist's time in Nova Scotia to a premature end. While enjoying one drink too many at a Digby hotel, Barton bet that he could fell a tree all by himself – something he had never done before. Dr. Joseph Martin bet that he couldn't. The next day, the loyalist picked up his axe and located an especially tall birch on his property. Barton managed to chop down the tree, but it crashed down on him, mortally wounding the loyalist officer. His friends buried Barton on February 19, 1788. Russell Lake, just outside of Halifax's twin city Dartmouth, is named for Nathaniel Russell. A Russell family tragedy eventually became part of local lore. When the loyalist's daughter was escorted home from a fireworks display, her jealous fiancee stabbed her to death before her parents' eyes. Cumberland County's Diligent River has an unusual connection to Nova Scotia's loyalist history. Governor John Parr and a friend had decided to go on a hunting trip one December. During their expedition, the hunters took shelter in the log cabin of Lt. Eleazer Taylor. This loyalist and his family had settled by a river to the west of Partridge Island (now Parrsboro). When Parr discovered that Mrs Taylor had just had a son, he offered to give the baby a 500-acre grant if the parents would name him John Parr. And so the first Taylor child born in Nova Scotia became both a landowner and a namesake of the governor. (John Parr Taylor lived to be 90 years old!) Parr was so impressed by Eleazer Taylor's industry and diligence that he named the nearby waterway Diligent River, which in time became the name of a town. The stories behind other loyalist place names of Nova Scotia will be featured in next week's Loyalist Trails. On the 25th of June, 1776, while Americans staggered south from Isle-aux-Noix on the Richelieu River to Crown Point on Lake Champlain, General Benedict Arnold received intelligence that the British had prepared for shipbuilding at St. Johns, Quebec. He notified General George Washington that the British would be masters of the lake, unless all effort was made to exceed them in a naval armament. Arnold took the next step by initiating naval shipbuilding for the American army. Ships carpenters from the New England coast and blacksmiths from nearby towns began to arrive at Skenesboro, at the head of Lake Champlain, where they built a fleet of gondolas, row gallies and sloops. Read the article – 3 short pages (PDF). During my research, I have come across a number of files and documents relating to the granting of lands to Loyalists in the Province of Quebec (includes present day Quebec and Ontario). The eighth one is titled: "Circular Letter from Henry Motz. Copies of Order in Council of November 9, 1789." Documents relating to the granting of lands to Loyalists in the Province of Quebec (includes present day Quebec and Ontario). RG1 L4 Vol. 3 LAC mf C-14026. PP. 291-292 Land Board Minutes and Records. Read "Circular Letter from Henry Motz. Copies of Order in Council of November 9, 1789." dated at Quebec 21st January 1790. Machiche is a little town on the St. Lawrence River in Quebec, where Loyalists settled for a time [during and after] after the Revolutionary War. Like the surnames of the people in this query (see response to query below), the name of the town has also been known by several different spellings. Originally known as 'Yamachiche', as it was called by the local Crees, the name was first used to identify the Little Yamachiche River (Petite rivière Yamachiche). The town itself is located on the St. Lawrence River, about 113km north-east of Montreal, where Martin Middaugh filed his claim in 1788. A few years prior to the arrival of the Loyalists, Machiche had received many of the Acadians who had been expelled from the Maritime areas in the years 1755-1764, as it was felt the French residents posed a threat to the colonies due to French aggression. In fact during this time, many of the French settlers of Acadia waged guerrilla war against the English, and this raised alarm levels. This tension ended on July 11, 1764, when the British government passed an order-in-council to permit Acadians to legally return to British territories, provided that they take an unqualified oath of allegiance. Machiche is truly a key location in Canadian history. Through family research, George has found ancestors and relatives on both sides of several conflicts, from the Salem witch trials to WW II. He shows how people from both sides - soon afterwards or in later generations - become reconciled. Well researched and well written, you will find this article quite interesting. Reconciliation (7 brief pages of material). I enclose for your interest the Notes for my after-dinner address last April, at the Washington Club (in D.C.), to the joint meeting of the National Order of the Blue and Gray (which is composed of members who are descended from both sides of our Civil War), and the Hereditary Order of the Descendants of the Loyalists and Patriots of the American Revolution. I know that the UELAC doesn't accept my descent from John Saxe as proved, but the HODLP does. I also have another ancestor, William Irish, who was a Loyalist, who fled to Canada from Vermont in 1777 after his brother John was killed by Rebels (as you know, we call them Patriots). He then returned to New York State and later settled in northern Vermont. Another brother, Peter, stayed in Canada and I believe his descendants are eligible for the UEL. The Irish family was Quaker, and tried to avoid the war. My talk was printed in The Bugler (Summer 2013), 13-18 - the newsletter of the NOBG. I enclose a copy of the masthead and title page (p. 13) from The Bugler, and my notes. Did you know that UELAC has a dozen honorary vice-presidents? Some of you may quickly recognize names such as "Gavin, Zig, Todd, or Dorothy" but you may be puzzled by "Orlo". The considerable contributions to our Association by Orlo Jones were recognized, but with little detail, in the Branching Out report from Abegweit Branch in the Fall 1989 issue of the Loyalist Gazette. Fast forward to 2013: Orlo's biography has been added to the file of National Honorary Officers found in the Honours & Recognition section. Thanks to Peter Van Iderstine, President of the Abegweit Branch, the collection of biographies of our UELAC Honorary Vice-Presidents is now complete. Where are Barbara and David Hongisto? To participate, submit a photo of yourself in UELAC promotional gear at a place of some note and tell us where it is. If you are a member of a branch, please indicate that as well – send to Jennifer Childs. Thanks to those who have contributed to the slowly growing index of Loyalists and the War of 1812. We have added a new entry for George Hughson thanks to Patricia J. Sadler Brown, UE. If you have a family ancestry which qualifies (see the heading of the page with entries), please submit to loyalist.trails@uelac.org. Our rich history continues to emerge through these family histories. Relive history, circle the date of October 5 on your calendar to attend the Battle of the Thames commemoration at Thamesville. Share the colour, sounds and FUN that an 1813 Regency Ball brings. It will be an evening to remember! At the Chatham Armoury (44 William Street) at Tecumseh Park from 5 - 11:30. 5:00 - The Drums, Crown Forces 1812 will serenade guests with the fifes and hors d'oeuvres will be served. 7:15 - there will be an aboriginal drum and dance demonstration. Dancing will continue until 11:30. Unfamiliar with dance steps from the early 1800s? Free dance lessons same day 10:30-12:30AM. Cathy will walk everyone through the dances that evening. Consider wearing Regency apparel to the ball. Suggestions for dress of that era can be found by googling “regency dress” or on the website listed below. Modern formalwear is the alternative dress. Tickets through www.cktickets.com. Cost for the dinner, dance and evening reception is $85 per person; for the dance and evening reception, $30 per person. Tables of 8: from the Box Office at the Chatham Cultural Centre Office (77 William Street N, Chatham) 519-354-8338, or online. Once you have purchased your tickets, please contact Linda Henderson 519-397-2417 or jlhenderson25@gmail.com to reserve the table – include names of persons in your party and the reservation name. Corporate tables are available. More information at the Battle of the Thames website. The Ball at the Forkes Committee hopes to see you at this 1813 Regency Gala! 17 [Date maybe] Coffin for remains of eleven soldiers of the 89th and 103rd Regiments killed in the Battle of Lundy's Lane, July 20th, 1814. The remains were discovered in a distant trench Sept 3rd 1891 and were re-interred in Lundy's Lane cemetery at 2 PM Oct 17th 1891. For the first time ever, Great Britain's copy of the Treaty of Paris 1763 is on display in North America. In honour of its 250th anniversary, the Treaty that redefined North America will be on display at the Old State House in Boston through October 7, 2013. Artist Joseph Blackburn flourished in the British American Colonies 1754-1763. His particular skill was in painting elegant fabrics & fashions on gracefully portrayed sitters. View a number of subjects in this article. Since 1745, the historic General Warren Inne in Chester County Pennsylvania has been centre stage for American history and a premier carriage stop for hungry travellers. Read its history since the Seven Years War - short article. David Ricketts UE, descendant of Hamilton founder George Hamilton, is at home in the city of his ancestor. History comes alive at Hempstead-on-Erie, a home built in 1813 on farmland Windsor and Essex County granted to John Snider by King George III as a reward for the family's loyalty. Article includes several photos, including some of the restored of the interior. Whitecap Dakota First Nation and the City of Saskatoon are seeking an artist and/or design team to create and install a Saskatoon monument project commemorating the bicentennial of the War of 1812. Niagara Historical Society and Museum Theatrical Cemetery Tours at Niagara-on-the-Lake on Sept 21, 27 and 28. Ship-board re-enactors got to see War of 1812 up close at the Battle of Lake Erie. And a collection of photos of tall ships and the events around western Lake Erie. Governor General to Officially Launch It's An Honour! Cross-Canada Travelling Exhibit about the Canadian Honours system and those who have been awarded, on Monday Sept 16 in Calgary. 18th Century Printed Cotton Fabrics. Silk, wool, and linen were the most plentiful fabrics during the eighteenth century. What should you look for when trying to approximate eighteenth-century cottons? What did Europeans and Americans wear in the period? And what's the difference between calico, chintz, toile, and indienne, anyway? Rare Bible rescued from trash provides missing family history for San Diego couple. I read with interest your inquiry in [Sept 1] Loyalist Trails. I don't know about that earlier information dated May 21 2008, as I did not know at that time that I had a UE ancestor and was not reading any Loyalist literature. I have come across these families before, in professional research for clients. The problem is, that the spelling of the surnames is scrambled. Now since Henry Bush father-in-law of Martin Middaugh died in 'the year 1779 or 1780 at Mashishe', this Henry Bush (KRRNY) who received the OC in 1790 was another Henry; and this Henry was the 'son of J.F.' I feel that he was likely the son of John Vandenbogist, and that John Vandenbogist and Henry Bush who d. 1779-1780 were brothers. Many thanks for such a prompt reply. I can certainly see how Henry Bosch/Van Den Bosch/Vandenbogist could be anglicized to Bush. When I reviewed my roll of refugees in lower Quebec before sending my email yesterday, I checked possible spelling variants without success. Looking at that roll again this morning, there is still no Henry Bush, or Mrs. Bush at Machiche AT ANY TIME, let alone 1779 or 80. 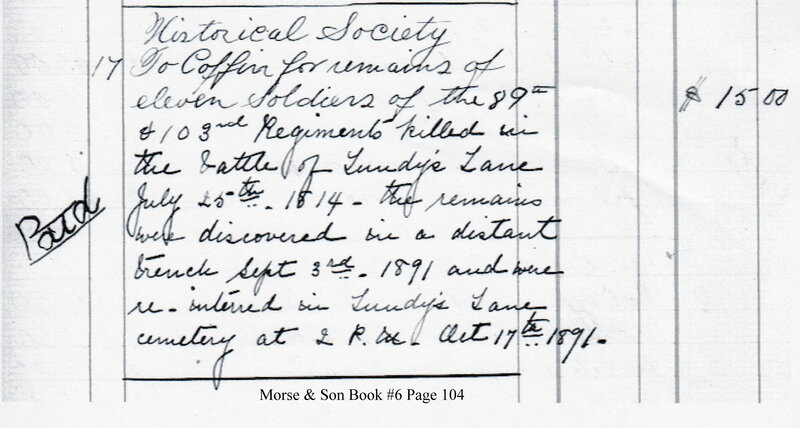 A likely explanation is that they arrived and died between muster dates. My thanks for drawing my attention to Martin Middaugh's claim. I not thought to check there before typing the email. Inexcusable. I do have a record of Pte Henry Bush of the 2nd battalion, King's Royal Yorkers. He enlisted on 25Aug81 and served until disbandment in 1784. My earlier research says he was from Pepacton in Ulster County. To my mind, there is no chance that he is the Henry Bosch who died at Machiche according to Martin Middaugh. Thanks to your answer, I will add the Bosches to my refugee roll.